Regular exfoliation can do wonders for the skin, the little and often approach works really well for congestion, dullness and blemishes to keep skin constantly renewing itself. I tend to have reactions to really strong peel masks, ugh, so serums, cleansers and moisturisers that include some mild form of acid or enzyme are my chemical exfoliators of choice. With these, I never have to worry about overdoing it resulting in an itchy tomato faced reaction or getting out the stopwatch to ensure I wash the product off after 4 minutes exactly. I simply include them in my normal skincare routine and everything is peachy. My four current favourites pictured above are all extremely gentle and offer different benefits for the complexion whilst gently sloughing off those dead skin cells to brighten and soften. 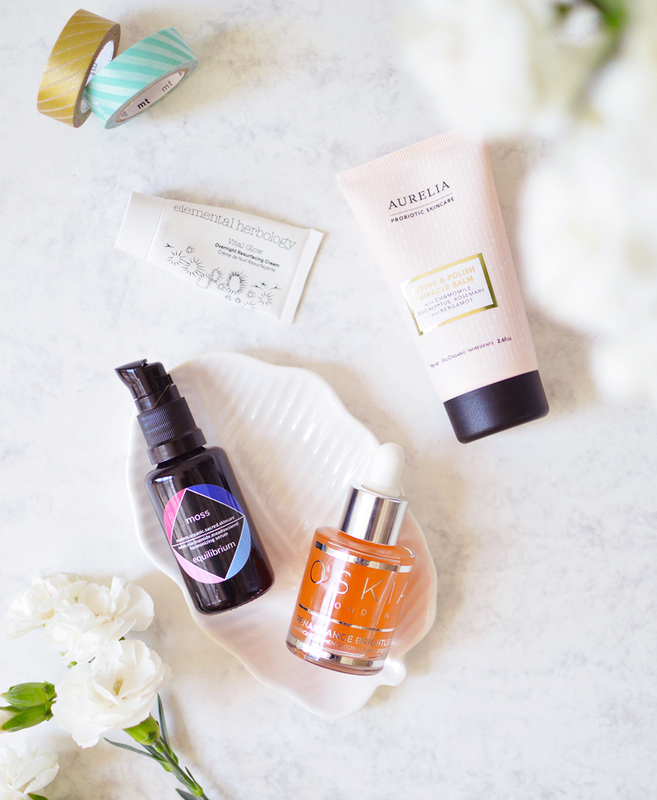 The Aurelia Refine & Polish Miracle Balm is a cleanser and mask in one. The balmy texture melts into skin and gently buffs away dead skin cells with tiny wax beads and a little fruit enzyme action. To use as a mask simply leave on the skin for 5 or so minutes to really allow the enzymes to do their stuff (you can tell they're working because of a subtle warming sensation), then you simply rinse away thanks to the emulsifying formula. I like using this as a quick mask most of all because it's pretty pricy, gotta make it worth the money! The results are peachy soft skin that has the look of using something heavy duty, but without any of the irritation. It's a good one to use before you hop in the shower as then you can rinse away those pesky scrubby bits with ease. Mine is just a little sample tube, but the Elemental Herbology Vital Glow Overnight Resurfacing Cream is, aside from being a wordy one, something that keeps surprising me with its effectiveness. This rich cream sinks into skin easily (I like to mix it with a drop or two of face oil) and leaves skin feeling nourished but not overly greasy - I do have oily skin but normal/dry types would probably find this quite lightweight. The complex blend of malic, glycolic and lactic acids get to work shedding dull skin to leave a brighter complexion come morning whilst a granactive retinoid stimulates cell turnover and reduces pigmentation, combine this with sacha inchi, argan and vitamin-C rich kakadu plum to add nourishment and you've got a perfect skin renewing treatment. My skin seems to get on really well with retinol serums so it's no wonder I like this, I use it just once or twice a week and my skin always looks so calm and fresh in the morning. I would be hesitant to buy a full size though as it comes in a jar... I hate dippy fingers and letting air get into something with so many active ingredients. Saving my favourite for last! The Oskia Renaissance Brightlight serum is a little powerhouse of super active ingredients to fade pigmentation, sun damage and brighten uneven tone. Whilst it's main job isn't to exfoliate the skin it does contain fruit enzymes (pumpkin and papaya I think) to leave skin smooth and remove any dead cells that are in the way to let the other ingredients work more effectively. I have a lot of acne scarring on my cheeks and this is helping loads to take away the ugly deep purple-ness of them and has softened them considerably - there's a long way to go but some progress is better than no progress at all. I love the light gel consistency of this serum, it feels like water on the skin which makes it perfect for layering with my usual moisturisers and oils. I'll write a full review up once I've finished the bottle, worry not. Have you tried any of these exfoliating hero's?